Democrats are still slightly favored to take control of the Senate after November’s elections. They need to gain a net of four seats if Hillary Clinton wins the presidency, or a net of five seats if she doesn’t. And the FiveThirtyEight polls-plus forecast gives them a 56 percent chance of doing so, while the polls-only model has them with a 54 percent chance of winning a majority. Polls continue to show a tight race in states such as New Hampshire, North Carolina and Pennsylvania, three of the four most important seats in determining who wins control.1 Not coincidentally, the contest between Clinton and Donald Trump in those three states is also close. That relationship — between the Senate races and the Trump-Clinton matchup — didn’t seem to be a given this year. 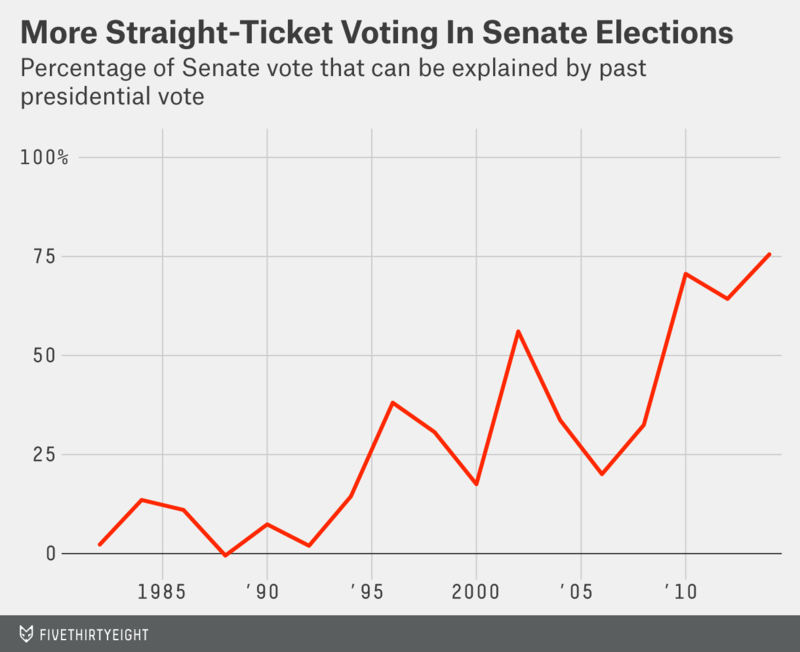 Split-ticket voting — when a voter chooses a Democrat for president and a Republican for the U.S. Senate, or vice-versa — has become far less common as the country has grown increasingly polarized, more closely linking the presidential election with down-ballot contests. But Trump is such an unusual nominee, it seemed possible more voters would separate him from down-ballot Republicans. For now, however, polarization appears to be winning out. Indeed, Senate polls in races across the country look a lot like the presidential poll results in those states. You can see this in the chart below, in which I’ve taken the margin in our adjusted polling averages2 for every state with a Democrat and Republican running for Senate3 and plotted it against the adjusted polling average in the presidential race in those states. The relationship isn’t so perfect that a good Senate candidate or other local factors can’t make a difference, even in battleground states being contested at both levels. In Ohio, for example, Republican Sen. Rob Portman is outrunning Trump by 9 percentage points. In Florida, Republican Sen. Marco Rubio is doing 4 points better than Trump. Or, to take the reverse case: Democrats Jason Kander in Missouri and Russ Feingold in Wisconsin are both running more than 6 points ahead of Clinton. There are also nonpresidential battleground states where the Senate races don’t look like the presidential race. Democratic Sen. Chuck Schumer is doing much better than Clinton is in her and Trump’s home state of New York, and Democrat Evan Bayh continues to outpace Clinton in Republican vice-presidential nominee Mike Pence’s home state of Indiana. 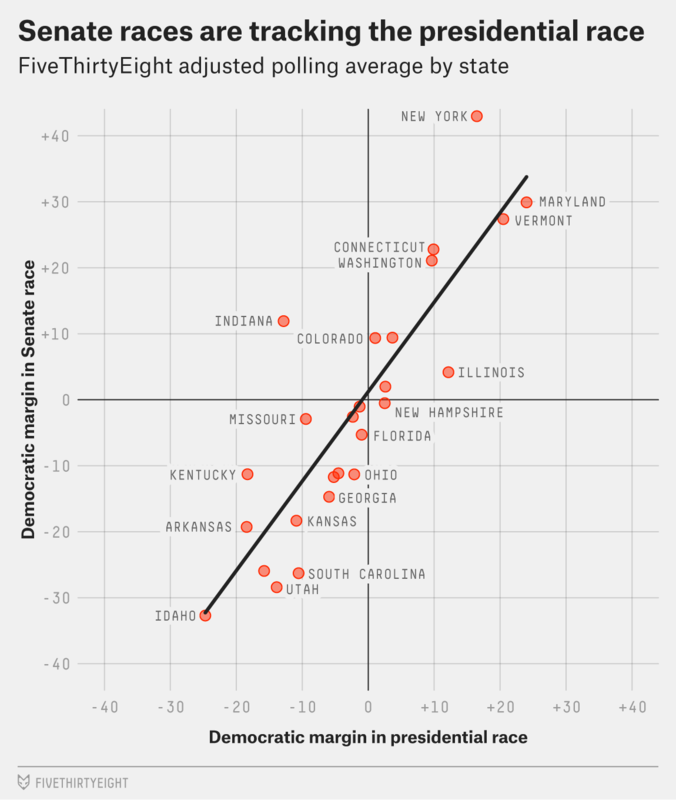 But for the most part there’s a clear connection between where the polls put Senate and presidential races in each state. In fact, the connection is about as close as we’d expect based on recent elections. Two years ago, my colleague Dhrumil Mehta and I noted that 77 percent of the variation in the 2014 Senate election results could be explained by the variation in the 2008 and 2012 presidential vote in those states. Using the same formula we used for that piece (but using the current polls to estimate the presidential vote in each state instead of the 2008 and 2012 results) shows that a nearly identical 76 percent of the variation in the 2016 Senate polling averages can be explained by the presidential vote. The eventual results could be different, and we’re not looking at the unpolled states here, but there’s no sign at all that the strange presidential race is upsetting the recent trend of voters supporting the same candidate in both Senate and presidential races. The 2016 election seems, at this point, to mostly be following the fundamentals. With the presidential race now so tight, its close correlation with Senate races isn’t hurting the GOP that much, but if Clinton regains a more sizable lead over Trump, Republican candidates for Senate will likely have a problem. Data as of the evening of Sept. 27. States without at least one poll are not included in this analysis, while California is ignored because two Democrats are running against each other in the general election. For the Louisiana Senate race, I’m using a sum of the Democratic candidates’ support and a sum of the Republicans’ (the state holds a single primary in which all the candidates from both parties run and the two top finishers (regardless of party affiliation) advance to a runoff if no candidate receives over 50 percent of the vote.